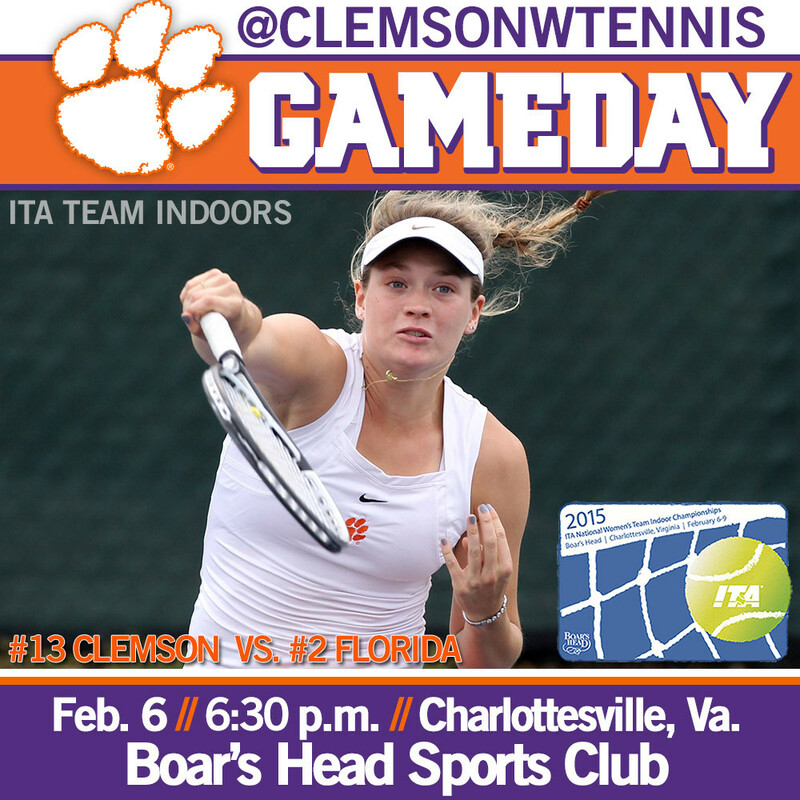 CHARLOTTESVILLE, Va. – The 13th- ranked Clemson women’s tennis team opens the ITA Team Indoor Championships against the second-ranked Florida Gators Friday, Feb. 6 at 6:30 p.m. The tournament is being held at the Boar’s Head Sports Club in Charlottesville, Va. and is hosted by the University of Virginia. Live scoring is available at VirginiaSports.com, and live updates will also be available on Twitter, @ClemsonWTennis. The Tigers, 3-1, are coming off of an emotional 5-2 win over in-state rival and 23rd-ranked South Carolina on Feb. 1. Clemson has two ranked singles players and one doubles team. Junior Joana Eidukonyte is ranked 27th by the ITA while senior Romy Koelzer comes in at No. 85. The duo of Beatrice Gumulya and Jessy Rompies is second nationally with a 15-1 record overall, including a 3-0 mark in dual matches. Scouting FloridaNo. 2 Florida is coming off a 7-0 win over No. 53 South Florida, their third consecutive dual-match sweep. The 3-0 Gators defeated Elon 4-0 and No. 68 Maryland 4-0 prior to the win over the Bulls. The Gators have six players ranked in singles, including three in the top 11. Brooke Austin is ranked sixth, Josie Kuhlman is ninth, and Briana Morgan is 11th. Kourtney Keegan is listed at 26th in the nation, while Peggy Porter and Belinda Woolcock are ranked 40th and 43rd, respectively. The Gators also boast five ranked doubles teams, including Austin and Keegan (seventh) and Porter and Kuhlman (17th). Florida leads the overall series against Clemson with a 22-1 record. In the most recent meeting between the two teams, the No. 4 Gators bested the No. 18 Tigers 6-1 in Gainesville. The winner of Friday’s match will face the winner of No. 7 seed Virginia and Southern Cal on Saturday.